Do your customers think you’ve forgotten about them? It’s not too late. There’s still time to win them back. With the right email marketing strategy, coupled with the best technology, executed at the right time, there’s no reason buyers should be left hanging. As I mentioned in my previous post about email welcome series and beyond, you’re already doing the most important thing right, which is getting customer emails. But as your customers progress along their subscriber path, it’s imperative to find new ways to create value for them. 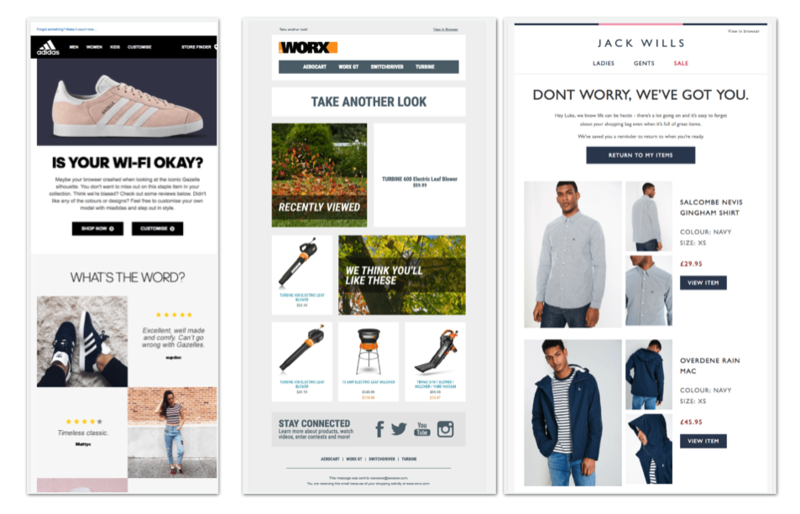 In today’s article we’re going to explore several best practices around abandonment emails, both cart and checkout, paired with tactics and examples for incentivizing subscribers to take that final step and buy. Thanks to exciting marketing technology, you now have a chance to win back lost customers who have not completed their buyer journey. But before sending an email, it’s important to differentiate between two crucial scenarios: abandoned cart and abandoned checkout. Abandoned cart is when a customer adds something to their shopping cart and leaves your site. Perhaps upon the prompt for submitting personal information, that customer closes their window and moves on. Think of it like a brick and mortar retail shop. The customer was simply window shopping. Abandoned checkout, on the other hand, is a completely different level of intent. These customers have gotten as far as possible in the buyer flow without converting. It means they’re ready to buy, but for some reason, didn’t complete the purchase. In this scenario, my recommendation to clients is to send an email about one or two hours later. Abandoned checkout should always take priority over abandoned cart because it’s closer to the final sale and easier to turn browsers into buyers. Be hyper specific, listing out products your customers abandoned. Be hyper valuable, with reminders of why your brand is different than the competition. Remember, just because customers abandon cart or checkout, doesn’t mean you need to send an email with only the exact product they left behind. You have their permission to send an email about anything. Take advantage of it and you’ll increase the likelihood of a sale. As you think about your different segments of customers, both abandoned cart and checkout, also think about what special offering might push them over the edge. Many companies will offer an incentive in exchange for email address, like free shipping, percentage off purchase, a thought leadership download, and so on. This is a easy way of communicating from the start that these emails are providing value, and they’re worth it to opt in. Whatever you offer and communicate about that offer, just make sure it’s customer centric. And be straightforward about the value proposition. Remember, people’s inboxes are competitive places, but you can cut through the clutter if you have the right strategy and tactics. With these abandonment and incentive best practices, customers will never feel like you forgot about them ever again. And you’ll have the sales to prove it. This post was written by Cory Smith, VP of Email, at Metric Digital. Click here to view the first post in Cory's series.